Romulus Mayor Pro-Tem John Barden assists Andrew Rayyan, owner of Tubby's Sub Shops with the store's ribbon cutting. They are joined by Tubby's team members and representatives of the Greater Romulus Chamber and City of Romulus. Photos courtesy of City of Romulus. 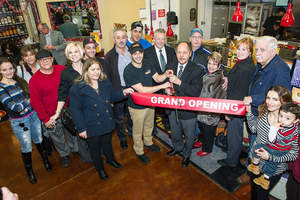 ROMULUS, MI--(Marketwired - Jan 5, 2015) - "When you've received as warm a welcome as we have from the Romulus community, it makes you want to work even harder," said Andrew Rayyan, owner of the new Tubby's Sub Shops in Romulus. Located in the Shell Ecorse Marketplace at 39315 Ecorse Road, the store held its official ribbon cutting and grand opening celebration in early December in partnership with the Greater Romulus Chamber of Commerce. Attending the event, which featured samples of Tubby's Famous Subs and the popular Grilled Steak N' Cheese, were representatives of the Romulus Chamber, city of Romulus, and Tubby's customers, along with Rayyan's family and friends. Guests were invited to participate in special store drawings for the Tubby's Family TV Time Giveaway of a 32-inch flat screen TV and Tubby's Subs for a Year. The prize drawings will take place at the Romulus store on Friday, January 30, 2015. "The drawing is just before the 2015 Super Bowl, and our Tubby's team will be ready to fill lots of party orders," added Rayyan. Tubby's Sub Shops in the Shell Ecorse Marketplace is open from 9 a.m. to 10 p.m. Monday through Friday, 10 a.m. to 10 p.m. Saturday, and 11 a.m. to 8 p.m. Sunday. To place an order, call 734-331-6653 or order online at www.tubbysgrilled.com. For savings and fun, follow the store on Facebook.com/TubbysGrilledSubmarinesRomulus. Founded in 1968, Tubby's Sub Shops is headquartered in Roseville, Michigan with 58 locations through the state. Owned in partnership by CEO Robert Paganes and Executive Vice President Bill Kiryakoza, the Michigan-based company is known for its unwavering commitment to quality products and customer service. Tubby's offers a variety of premium quality grilled submarines and other menu items that are available for dining-in, carryout, delivery and catered events. Tubby's participates in various community events throughout the year and is a proud sponsor of the Detroit Lions. For more information, visit www.tubbysgrilled.com.